“Fish are friends, not food.” In the spirit of this wisdom from the beloved Pixar films “Finding Nemo” and “Finding Dory”, I decided to revamp my recipe for tuna casserole by replacing the fish with extra-firm tofu. It’s delicious and does taste a lot like tuna without harming any of Dory’s fish buddies. 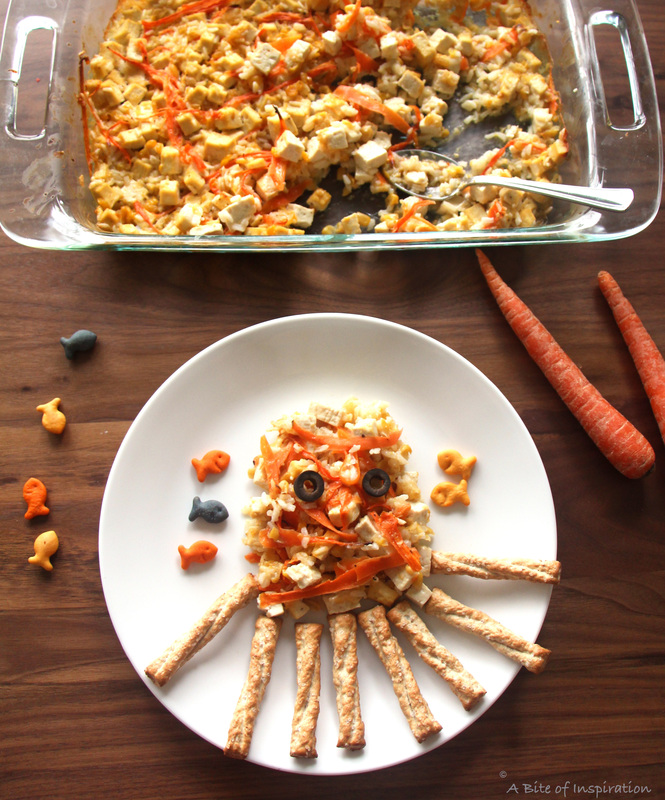 You can serve the casserole as is or create Dory’s octopus friend, Hank, using pretzels, olives, and goldfish. Fun for kids and delicious for the whole family! I practically grew up on the beloved Pixar film “Finding Nemo”, so you can only imagine my excitement when “Finding Dory” hit theaters last summer. I’m sure many of you felt the same way. When the movie opened last June, my dad and I were the first ones in the theater because DUH, it’s “Finding Dory”. So, we were sitting there and this big, burly, sort of tough-looking guy walked in with his wife and sat down a few rows ahead of us. We were just minding our own business, reminiscing about the original movie, when the guy suddenly turns around, points to his wife, and says, “She made me come to this movie, you know”. We both just blinked at him. I mean, we were clearly there to see the movie too, so who were we to judge him for being there? I finally responded, “Don’t worry, sir. It’s fun! You’ll enjoy it.” He kind of grunted and then turned back around. As you can probably guess, when the movie finally started, anti-Finding-Dory-guy was laughing longer and harder at every single joke than anyone else in the theater (except, for me, of course). See? “Finding Dory” is irresistible. I’m glad he enjoyed it. If you read my Vegan Thai Curry Mac and Cheese post inspired by “Ratatouille” (this is my most popular recipe, by the way—check it out if you haven’t already! ), you know that I’m a huge fan of Pixar films. I own DVD copies of every single Pixar movie ever made. Not sure if that’s something to brag about or not, but now you know. My newest one is, of course, “Finding Dory”. Inspired by the DVD, I decided to create a super easy, kid-friendly recipe that your whole family will love. Since a guiding theme in the original “Finding Nemo” film is “fish are friends, not food”, I figured Dory wouldn’t be very impressed if I decided to use real fish in a recipe inspired by her movie. So, instead, I decided to make a No-Fish “Tuna” Casserole that uses extra-firm tofu instead of tuna. See? No friends or fish were harmed in the making of this casserole, Dory! The tofu is cut in small cubes and does taste surprisingly like tuna! This recipe is super easy. All you do is dump the ingredients in a casserole dish, bake for 40 minutes, and you’re done! It’s in the oven before Dory even has time to forget all the ingredients. ? Then, comes the fun part. 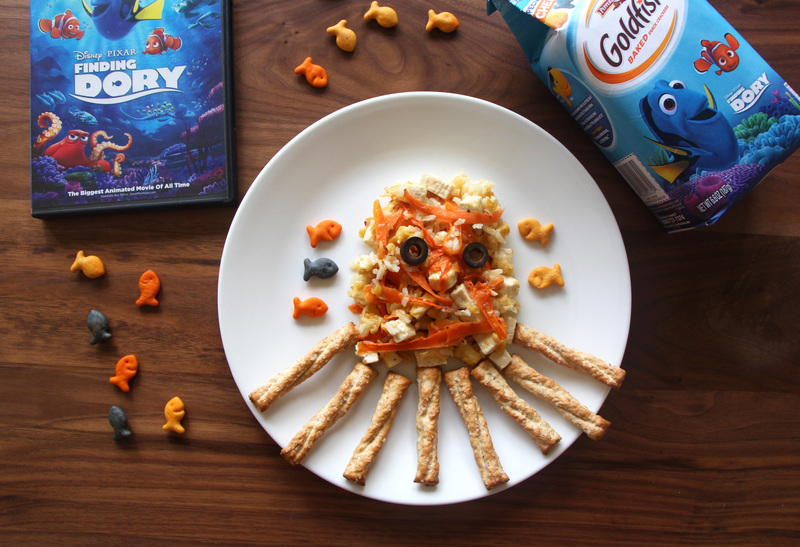 You get to use your baked No-Fish “Tuna” Casserole to create Dory’s new BFF, Hank, the grouchy, but loveable octopus. Well, the septopus, technically. Hank lost a leg “somewhere along the way”, but he proves throughout the film that you don’t need all your legs to be a hero. I used shredded carrots to mimic Hank’s orange color. Once you mold the casserole into his body shape, it really does look a lot like him. I used sliced olives for his eyes and Braided Pretzel Twists for his legs (I used 8, but you can use 7 for authenticity!) The crowning jewels of my food/art creation are the cute little Dory, Nemo, and Marlin goldfish swimming around Hank. How cute are they? I was SO excited when I found these “Finding Dory” goldfish . You can also use regular goldfish. Just keep swimming. Just keep swimming. Just keep swimming, swimming, swimming. What do we do? We swim, swim, swim… Erm. What was I talking about again?? Oh, yes! Dory’s delicious casserole. This dish was actually adapted from a tuna casserole recipe printed in the Mini Page about 15 years ago. The Mini Page was a kid’s insert in the Washington Post that had recipes, articles for kids, games, and other fun stuff. I was obsessed when I was a kid. I couldn’t wait for my dad to bring home the paper every Sunday, so I could read the Mini Page, the comics, and the TV Guide. Oh, how times have changed… I haven’t looked at an actual TV Guide, since they started putting the guide right on the screen. Craziness. Sadly, they stopped publishing Mini Page in the Washington Post awhile back, but their tuna casserole recipe lives on through this blog post! 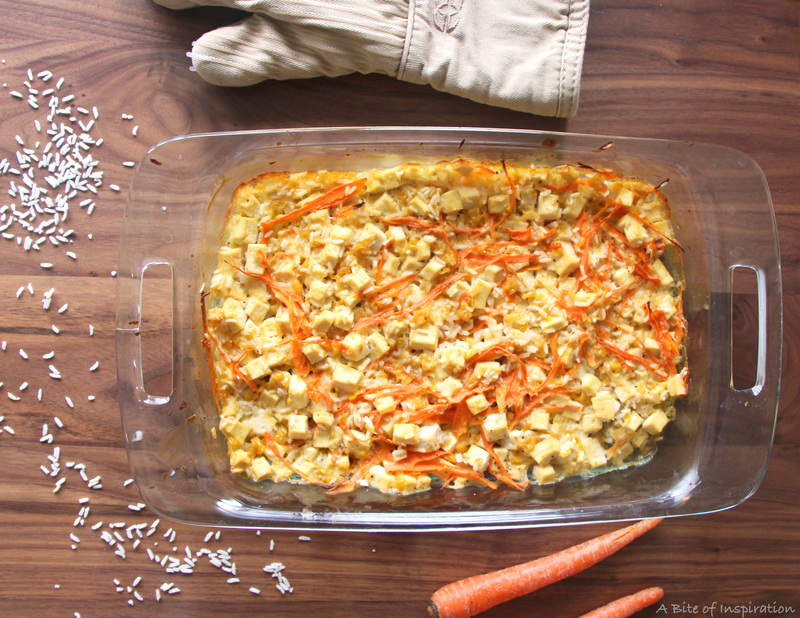 This gorgeous casserole has creamy corn, sweet carrots, and yummy rice. The original recipe had tuna, obviously, but I swapped that out for extra firm-tofu and it tastes just as delicious. I’ve been making this recipe for almost 15 years, so I’ve changed it quite a bit from the original. But, the overall taste and ingredients are similar. You’ll be amazed at how creamy this casserole is considering there’s no dairy products. The creamed corn and the dash of soymilk make for a really gorgeous texture. The carrots add a beautiful sweetness and the rice makes it a complete meal. This casserole is both vegan and gluten-free on its own, if you don’t add the goldfish or pretzels on the side. I hope you enjoy this fun, healthy family-favorite! And, remember, ALWAYS keep swimming. P.S. You can make this casserole with tuna instead of tofu, if you want. Dory won’t like it, but I won’t tell. ? 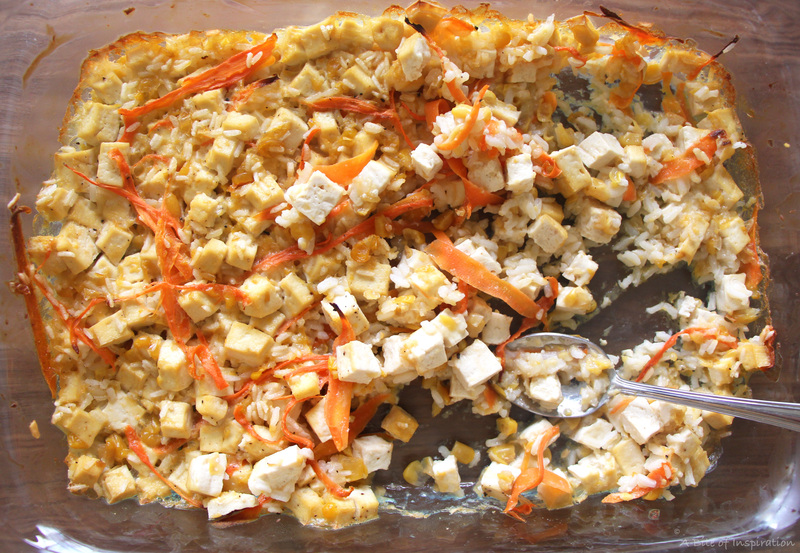 Add the tofu, cream style corn, carrots, rice, and soy milk to a 9 x 13 inch casserole dish. Stir well, but gently, so the tofu doesn’t break apart. Add salt and pepper. Stir again. Place casserole dish in the pre-heated oven. Bake for 35-45 minutes until bubbly. Allow casserole to cool for 5-10 minutes. Put equal amounts of casserole in the center of 4 large plates. Use the back of a spoon to push casserole into an octopus shape (an oval with a flat bottom). Put two slices of black olive on top of each shape for the eyes. Arrange 7 or 8 pretzels underneath for the legs. Arrange goldfish around the octopus. Enjoy! This casserole is gluten-free, dairy-free, and vegan, if you omit the pretzels and goldfish used to make the octopus. You can also use gluten-free pretzels and gluten-free/vegan fish crackers, if you can find them! I love the inspiration behind this! This is one of my kids’ favorite movies. I am a huge fan of tofu, and have never tried it in a casserole. Looks tasty! Thank you, Riva! I love adding tofu to casseroles. Definitely give it a try! What a fun recipe and the name is adorable. 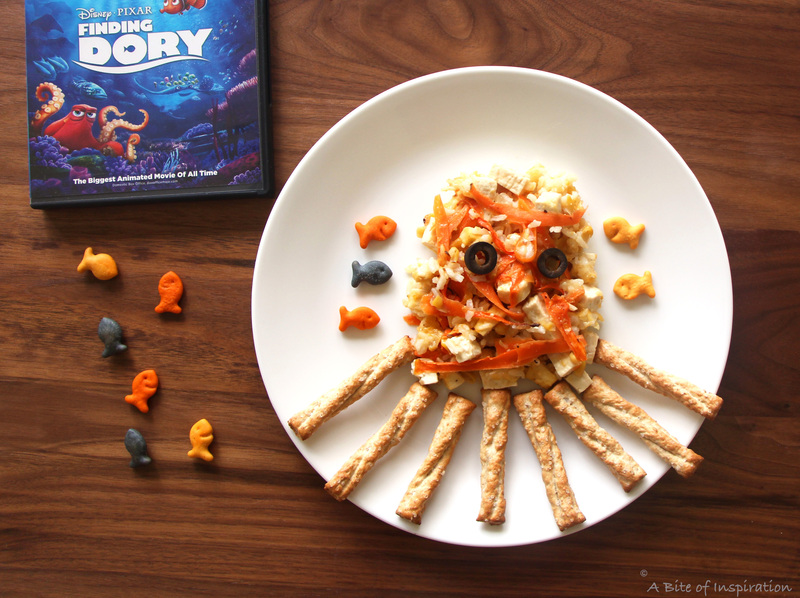 This is a cute recipe for a Dory themed party too! Clever! You’re a girl after my own heart, Jo! I loved the part at the end with the otters too. So adorable. Hope you enjoy the recipe! Thanks for stopping by! I love the idea of replacing fish for tofu! I’ve never tried such a casserole before but I surely will! Thank you so much, Jovita! The tofu is delicious in this casserole. Hope you enjoy! Love how you’ve taken inspiration from a film – I’m a big PIXAR fan too – how can anyone not be? And I’m a big fan of tofu too, so I can imagine this works very well. Totally agree, Kavey! Pixar is the best! Tofu does work really well in this casserole. Definitely give it a try. Thanks for stopping by! That is absolutely adorable. I just saw Finding Dory and liked it a lot. Using it teach kids to eat tofu is a great idea. And what kid could resist the “Hank” presentation. Really fun! How cute! My kids would absolutely love helping me put this together and eating it. Finding Dory is a favorite for them. Thank you, Tara! I hope you and your kids enjoy this dish! This was one of the most fun posts I’ve ever read! I love how you tied the recipe in with one of your favorite films, so sweet! I’ve never cooked with tofu but I do love tuna noodle casserole. This would be an excellent way to incorporate tofu into our meal plans, thank you! 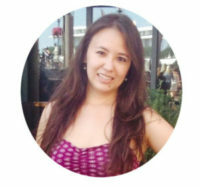 such a fun post to read! is there a substitute for the instant rice? can precooked regular rice be used? thanks for any tips. JOYCE!! You have to watch “Finding Dory” ASAP! You’ll love it– I promise. And, be sure to make this casserole for when you watch it. 🙂 I still destroy the newspaper looking for the comics. Some things never change, huh? I do miss the Mini Page though… Hope you enjoy and thanks for stopping by!